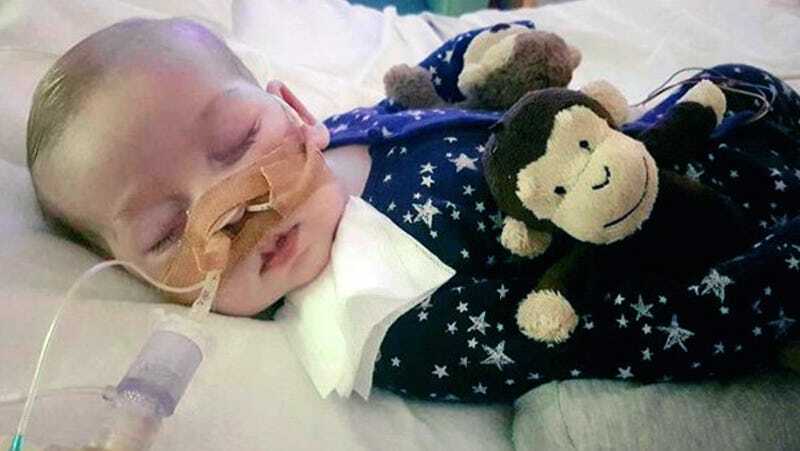 On Monday, the parents of Charlie Gard, a terminally ill baby being treated at Great Ormond Street Hospital in London, announced that they were ending their fight to bring Charlie to the US for experimental treatment. The couple said they had wanted to give Charlie a real chance of getting better and that a “whole lot of time has been wasted.” Yates says she hoped that Charlie’s life would not be in vain. The couple felt that continuing their fight would cause Charlie pain, he said. The case was “worthy of a Greek tragedy”. Charlie’s parents apparently decided they would be ending their court case on Friday, but wanted to spend the weekend with their son before making an announcement that would draw even more media attention. Charlie’s case has been receiving international attention, even attracting comments from the Pope and Donald Trump. GOSH has long maintained that Charlie’s brain damage is irreversible, though his parents disagree. The purveyor of nucleoside treatment, Dr. Michia Hirano, had given a conservative estimate of it having a 10% chance of success, but once he flew to the UK to examine the baby, he announced the treatment would not be viable considering Charlie’s advanced condition. “A lot of things have been said by those who know almost nothing about this case but feel entitled to express opinions,” said Francis.